We’ve hunted, searched, studied, and scrutinized graduate schools throughout the U.S. in an effort to provide you with a complete list of the best master’s degree programs in psychology with an applied behavior analysis (ABA) emphasis. Whether you’re preparing for BCBA certification and looking to earn a master’s in psychology as your terminal degree, or if you’re positioning yourself to earn a doctorate so you can become a licensed psychologist, concentrating your studies in applied behavior analysis opens the door to more options than virtually any other area of psychology. Of course, you can always take the courses you need for BCBA certification as a stand-alone course sequence if you already have a master’s degree or are currently enrolled in a master’s program that doesn’t include the right course content. But taking the right blend of ABA courses doesn’t need to be an afterthought. If you’re fresh out of your bachelor’s program or otherwise ready to make your move by earning a master’s degree, why not just enroll in a program that already includes the courses you need and save yourself the extra trouble and expense? You’ve come to the right place. Our list includes only master’s degrees (MA, MS) in psychology that include an ABA track or concentration, and all include a Behavior Analyst Certification Board (BACB) Verified Course Sequence (VCS). Earning a psychology degree through a program that has already had its ABA course sequence verified means you won’t need to worry about whether you’ve met the course requirements required to take the BCBA Certification Exam. To help you make an informed decision, we’ve done the work of finding the information you need and put it all in one place. We identified the features we know psychology graduate students need when researching options: tuition rates… delivery method (on-campus, online or hybrid)… student to faculty ratio… along with some key highlights of each program. We carefully reviewed dozens of university disclosure pages and analyzed data published in the National Center for Education Statistics database, presenting our findings here to make it easy for you to compare programs. 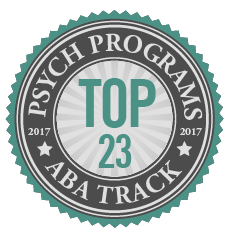 So here it is – our pick for the 23 best psychology programs in the U.S. that offer an emphasis in applied behavior analysis. Jacksonville State University’s master’s program in psychology offers an ABA emphasis, providing both the ABA courses you need to qualify for the BCBA Certification Exam, as well as courses in the experimental analysis of behavior (EAB). We also love the hands-on ABA experience psychology students get on-campus through the school’s animal and human research facilities, as well as field experience through local practicum sites. The MA in Psychology through California State University provides students with two options: either general/experimental psychology or ABA. Upon completion of this program, you will have completed the required courses necessary to sit for the internationally recognized BCBA certification examination and enter the field ready to provide effective therapeutic interventions for kids and adults with ASD and other cognitive impairments, behavioral management consultancy in business and industry, or virtually any other area where ABA has found it’s niche. California State University is always a sure bet for ABA study, as this university provides world-class education at an affordable price that is well below the national average, whether you’re a California resident or you reside outside the state. The MS Psychology program in ABA through Cal State Stanislaus is another great example of an affordable graduate program at a world-class institution. Students of this program enjoy a unique combination of training in theoretical, applied and experimental psychology, while close mentoring by faculty ensures students remain on track throughout the program. A unique, hybrid program that blends a traditional classroom format with several online classes is just one of the reasons why we love Pepperdine University’s MS in Behavioral Psychology. We’re also fans of the program’s small class sizes that provide plenty of opportunities for close peer and faculty interaction. Students of the University of the Pacific’s MA in Behavioral Psychology-ABA track learn data observation, collection methodology, single-subject design interventions, and more. But beyond the classroom, this program is a smart choice because students here are placed in practicum and internship sites where they can take what they learned in the classroom and put it to work in the real world. Some of the diverse practicum settings available to students here include the Community Re-Entry program, the Stockton Unified School District, and the Valley Mountain Regional Center, among others. If you’re looking for a school in the south that’s earned a name for itself in the behavior analysis field, Florida State University is your choice. FSU has been a leader in behavior analysis research and has consistently achieved a Top 50 status among published authors and institutions alike. Research in ABA doesn’t get any better. Nova Southeastern University’s Mailman Segal Center for Human Development is just one of the reasons why a graduate program in counseling with an ABA emphasis here is a smart choice. The Center is among the nation’s largest and most respected training facilities for education and research in the field of human development with a focus on early childhood development. The University of Miami always makes our list of top grad programs in ABA, for a number of reasons. The research and services programs through the Department of Psychology are second to none, consistently ranked near the top for National Institute of Health (NIH) funding in psychology. And the Department’s Behavioral Medicine Research Center is a successfully interdisciplinary program that encourages collaborative efforts for research in medical settings. We love Purdue Global for being a solid player in offering online ABA programs. In addition to providing students with the necessary coursework to sit for the BCBA exam at an affordable price that is the same no matter where you live, Purdue Global helps students secure a practicum that allows them to gain the field experience necessary to qualify for BCBA certification. McNeese offers the best in flexible psychology programs with an ABA emphasis. In addition to offering both online and on-campus course delivery options, McNeese State provides many graduate assistantships. Most graduate assistants here are part of the clinical treatment team in the McNeese Autism Program. Northeastern has been providing graduate programs in ABA since 1976. Its 40+ years of history in ABA has earned it a solid reputation for being a top-notch research facility and earns it an easy spot on our list of top psychology programs with a concentration in ABA. If you’re looking for an accelerated program that will allow you to earn your MA in Psychology and sit for the BCBA exam in less time than you may have thought possible, then consider the University of Massachusetts Dartmouth program, which can be completed in just 7 semesters. The Michigan School of Professional Psychology offers more than just courses in ABA—its program in ABA is based on experiential learning and self-exploration, with courses and activities focused on dialogue and the expression of personal insights. We love the research opportunities available to psychology students studying ABA at the University of Southern Mississippi. For example, the School Psychology Service Center includes a Behavior Analysis Lab for the best in graduate student training. The Behavior Analysis Lab supports behavior analytic clinical services, research, and training. Studying ABA through the University of Nevada Reno’s Department of Psychology is a smart choice, as psychology remains one of the largest majors at the university. With internationally renowned, doctorate-prepared faculty members shaping this successful program, you know you’ll be learning from the best in the field of applied psychology. Rider University holds the distinction of being among the top tier of northern regional universities offering master’s degrees according to U.S. News and World Report, so you can feel confident knowing that their MS in Applied Psychology with an ABA focus is the right choice. We are also impressed with the faculty here, all of whom have extensive experience in behavior analysis, research methods, and applied research, developmental disabilities, and special education. UNCW offers two psychology programs with an emphasis in ABA, and is the only school on our list to offer an option for undergrads. We bent the rules a little by featuring this combined degree on our list of master’s programs, but we thought it was worth it. The master’s program not only includes a practicum in both research and applied settings as part of the curriculum, it also places students in an internship with a local provider for a full 1000-hours of experiential learning in the real world after completing required courses. The University of Central Oklahoma churns out highly qualified graduates who are prepared to take the BCBA certification exam and deftly meet the behavioral health needs of their community. The expert faculty that oversee the BCBA course sequence included in the MA in Psychology program have years of experience, both in the field and in academia. The Philadelphia College of Osteopathic Medicine provides students with a highly focused program in School Psychology with the option to complete ABA coursework. This world-renowned college is for the motivated student who won’t settle for anything but a first-rate education. Your psychology graduate work with an ABA concentration at the University of Texas Rio Grande Valley is complemented by the Psychology Department’s state-of-the-art Behavioral Neuroscience Laboratory. We love this competitive program because of its reputation for featuring a highly focused course of study. JMU’s Department of Psychology with a behavior analysis concentration is a program where face time with professors is supplemented with peer advisor meetings with psychology students trained to provide academic assistance and career guidance. If you want a program that will provide you with ongoing support, JMU is the place for you. The University of Wisconsin Milwaukee is an obvious choice for graduate work in psychology with a focus on applied behavior analysis. It is among the nation’s largest research universities and has recently contributed groundbreaking research projects that looked at effective teaching strategies that provide children with ASD and other disabilities with self-help skills. Note: Student-to-faculty ratios shown are institution-wide and not specific to the featured program. Tuition and related fees do not take into account any type of financial aid assistance you may qualify for, and books and related expenses are not included in the total.